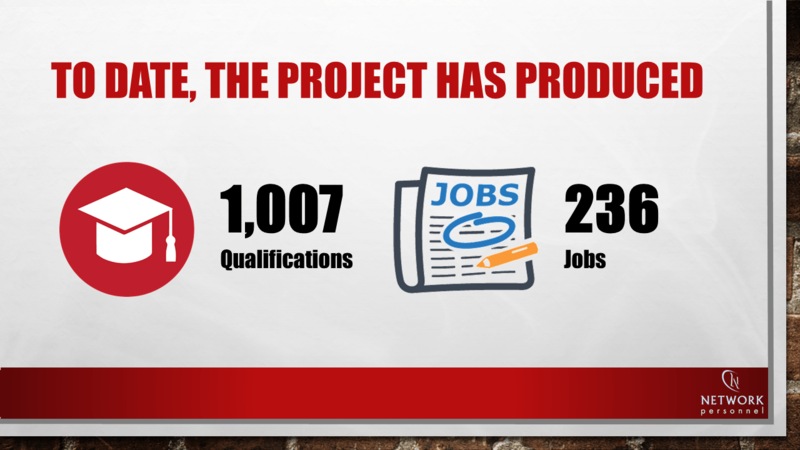 247 unemployed individuals find employment, 1,007 qualifications gained! Network Personnel has marked the achievements of those who participated in the ‘Up for Work’ programme at a celebratory event at its premises in Rainey Street, Magherafelt. The ‘Up for Work’ project which started in 2011 and will finish at the end of March 2015, is a ‘back to work’ initiative for the long term employed in the Magherafelt and Cookstown areas. Participants were presented with certificates in a wide range of subjects including Computing, Essential Skills, Environmental Conservation, Health and Safety and Horticulture. One of the most exciting aspects of the programmes has been the environmental initiative through which temporary employment opportunities were made available to 72 local unemployed people. Environmental teams worked on an extensive range of community projects providing an invaluable service to community groups. They also engaged in heritage focussed projects such as path laying in the Sperrins and restoration of built heritage features including the stone walls at Lissan House and at the new Maghera Community Walled Garden. Additionally, as part of the programme 202 participants availed of 6 months temporary employment with local companies, providing them with an excellent stepping stone to permanent jobs. ‘this project has been a win-win for the Magherafelt and Cookstown communities. Not only have outstanding numbers of participants found work and gained qualifications but 134 local community groups have benefited from gardening and minor refurbishment work (free of charge) through the efforts of our environmental teams. Over 200 businesses have also had temporary employees for a 6 month period giving the opportunity for clients to gain valuable experience and the companies the time to assess their potential for full time employment either with them or with other organisations. Moreover the opportunities for bringing more visitor numbers to the Sperrins have been increased by the creation and upgrading of hiking routes’. Ann McBride went on to say ‘the successes from the programme can be attributed to our team of staff (Administrators, Supervisors, Trainers and Employment Mentors). They have a genuine commitment to helping each and every individual who joins the programme, achieve qualifications and ultimately find employment – we offer a level of service to our clients that we ourselves would like to receive.